The trade story for that image on December 18th 2006 is not the profit of $1400 dollars. 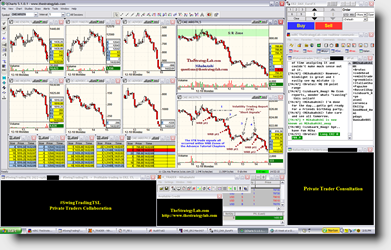 The story involves the missed VTR trade signals that would have resulted in a profit of +10k trading day along with realizing serious problems in my documentation of my chart configuration on my monitors. Thus, I want to highlight the importance of maintaining a trade documents more that just a daily broker statement. In 2006 I thought my documentation was good enough...simple & easy. Yet, in comparison to what I do today in my trade journal...my documentation back in 2006 was a joke and I often had missed trade signals like that of December 18th 2006 because of my poor documentation prior to 2006 didn't prepare me for changes in volatility that impact my analysis & trade decisions of the trading day. Simply, I would soon learn in 2007 (after trading days like that on December 18th 2006) that my chart configurations can not be static (the exact same) throughout the trading day as if the markets or volatility never changed.